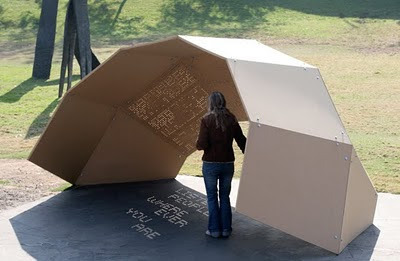 Many designers talk about the intersection of art and science, but the "One Day Poem Pavilion" actually delivers. I was immediately taken by the idea of Jiyeon Song's piece when I first posted about it, and obviously I still am. Enjoy! Artist Jiyeon Song has created a sculptural structure that utilizes perforations carefully arranged throughout the top surfaces. As light shines through the Pavilion's holes at different angles, legible text is created on the sidewalk underneath. Different lines from a poem appear at different times of the day, due to the position of the sun. What is super cool is that (again, due to the sun's position) one poem appears during the summer, and a different poem appears in the winter. The resulting effect is inviting and magical. Within the pavilion, the poem can be seen between 8 AM and 4PM. The poem consists of 5 lines with each line lasting about an hour. The slowness of the message offers us a meditative moment within our hectic lives. You can see a timelapse movie of the piece in action below or on the website as well. The entire Experiential Typography website is worth a look as Jiyeon Song carefully documents and articulates both the art and the science of the creative development process underlying a piece like One Day Poem Pavilion.